The cardiorespiratory and musculoskeletal systems can be trained to handle this endurance stress. As more information is learned through research about an athlete’s ability to perform both aerobic and anaerobic exercise as well as techniques to improve musculoskeletal function including strength and flexibility training, true athletic performance can be achieved. Injury prevention and management continue to be a significant component of triathlon participation. Repetitive stresses on the body can cause tissue breakdown and subsequent injury. A broken engine doesn’t go very fast. Along with injury management comes a psychological component of training and racing that includes learning to sustain efforts or, as some veterans like to say, to suffer. Digging deep remains an important determinant of performance in endurance sport competition. Some people seem able to push harder and longer, but for most triathletes, the stress of digging deep sometimes does not compare with the pressure of balancing family and work with the rigors of training and racing. The terms triathlon widow and triathlon widower are not uncommon among those in the triathlon community. For all that is said in jest, this stress, along with the commitment to a healthy life, can seem somewhat overwhelming to new triathletes. After finishing a triathlon of any distance, the elation and celebration often are shared by all those who supported the effort and are well worth the commitment. With all the knowledge and gear at our fingertips, why don’t we all train and race like the pros? Genetics plays a significant role in a person’s athletic ability. Some have the athletic genes, and some don’t. Personal commitment and a well-thought-out training program can help an athlete improve performance. The training philosophy of quantity versus quality regarding volume and types of workouts has changed over the years. This is especially true for maturing athletes, those over 40. We all like to think we are still kids and able to train with reckless abandon, but no matter what our age, our bodies can remind us differently with aches, pains, and potential injury if we don’t pay attention to our well-being. Endurance capabilities peak at around age 35 and progressively decline until about age 50, after which they decline more significantly. Muscle mass peaks in the mid 20s and progressively declines each year. Sorry for the bad news. On the positive side, science also shows that exercises focusing on increasing strength can reduce this muscle loss. The loss of flexibility, which also accompanies increasing age, can be altered with stretching exercises that help maintain function and reduce injuries. Endurance training for the mature athlete requires this special attention and a lot of tender loving care to sustain a consistent training and racing schedule. Controversy does exist as to whether strength training actually improves performance. Any coach or sports medicine physician will support a well-outlined training program that includes both strength and flexibility training. The goal of the program should be to promote musculoskeletal health and improve the body’s ability to withstand the repetitive stresses placed on it by endurance activities. The development of strength with sport-specific exercises as outlined throughout this book also improves economy of motion, or the ease with which you perform an activity. This will help you go faster and decrease stress on the body. This excerpt is from the book, Triathlon Anatomy. It’s published with permission of Human Kinetics. 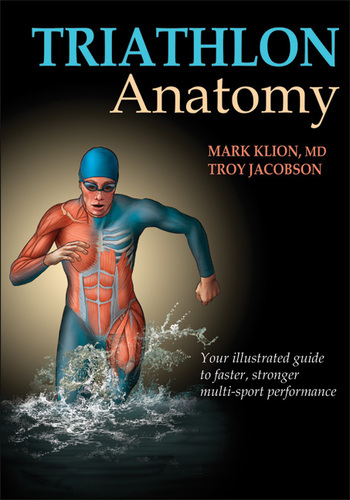 Purchase this book from Human Kinetics and help keep MyTriathlonTraining.com in online.